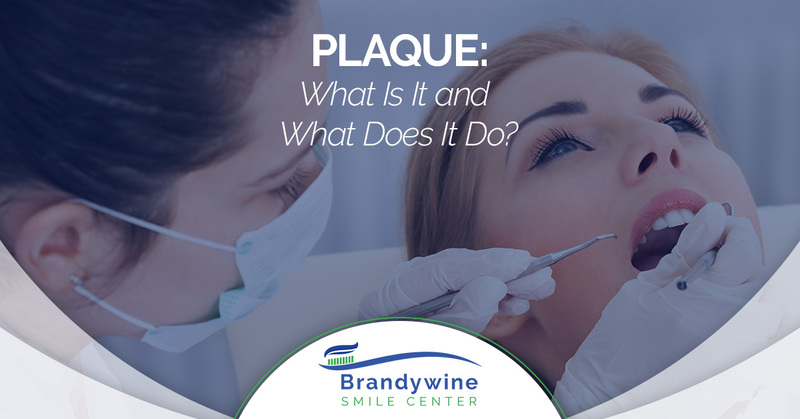 Plaque: What Is It and What Does It Do? When you’re looking to improve your oral health, one of the biggest things to focus on is mitigating the effects of plaque. In order to do that, you need to have an understanding of what plaque is, how it develops, and what it can cause if left unchecked. With that in mind, we’re going to take a look at plaque to help you fight its effects. For a dentist you can trust here in Glen Mills, call Brandywine Smile Center. We’ll help you get the smile of your dreams. Plaque is a sticky and colorless film that develops both in between and on the surface of teeth. It is comprised of microorganisms such as Streptococcus mutans and other forms of bacteria. It can also take hold above the gum line (supragingival), on the roots of the teeth below the gum line (subgingival), and along the gum line itself (gingival). If plaque is left alone to build up, it can harden into calculus or tartar, which will then need to be removed by professional means. -What happens when plaque builds up? When you eat, the bacteria within plaque release acids that damage the surface of your teeth. This occurs throughout the mouth but is often centralized above and below the gum line, as well as in between your teeth. When this happens repeatedly, your tooth enamel is worn down, resulting in tooth decay and cavities. If it is able to accumulate below your gum line, it will cause a great deal of irritation and inflammation of gum tissue, which will develop into gingivitis and other forms of gum disease. When gums are irritated and inflamed, they will look very red, and will likely bleed when you brush or floss. As plaque continues to build up, it can damage the structure of your teeth and the bone that supports your teeth and gums. This can all result in further health complications, especially related to the heart, as plaque can build up within the arteries and create blockages. -How can plaque be removed? If your gums don’t appear red or inflamed, regular brushing twice a day and daily flossing can help break up the plaque that naturally forms on your teeth. It’s recommended to brush with a fluoride-based toothpaste to make removal from the surface of your teeth easier. Floss or interdental cleaners can help to remove it from between your teeth. However, if you do notice your gums are inflamed and red, or if they bleed after you brush, it is important that you visit your dentist. You can help prevent gingivitis and early periodontitis with regular teeth cleanings at the dentist, along with consistent brushing and flossing while you’re at home. If your dentist notices an excessive buildup of plaque, tartar, or calculus below your gum line, scaling or root planing may be necessary to remove it. -How can you prevent plaque build up? Avoiding sugary or starchy snacks. Eating a balanced diet filled with vitamins and nutrients. Reduce the amount of snacks you eat in a day. Brush your teeth twice a day with a fluoride-based toothpaste. Floss daily, or use an interdental cleaner. Plaque buildup can cause severe damage if it is left unchecked. Follow these tips and visit your dentist regularly to ensure you avoid tartar, calculus, and gingivitis. Call Brandywine Smile Center today to schedule a cleaning and start your road to a healthier smile.